Willa Jean's Chef Kelly Fields on how scuba diving can save your sanity. 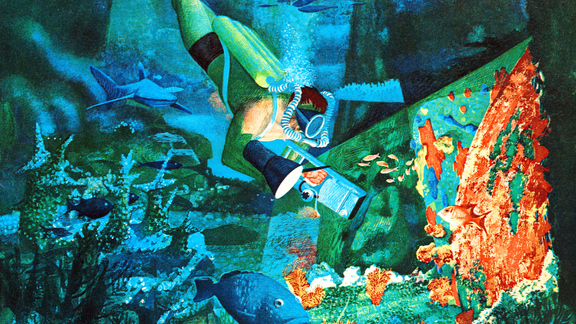 I can’t remember a time when my family wasn’t into scuba diving. We are all very sporty, and we grew up on the water. Plus, my mother’s family lives in Florida, so we’d meet there as often as we could for family trips — my cousins and uncles always went scuba diving, so when I was really young, I decided I wanted to go out and learn how to do it. My first real scuba diving experience ended up actually being in the Red Sea in Israel. That was an unmatched experience: crystal clear waters, absolutely stunning, it was like being a guest in another world—a total escape. Like I was relinquishing power, just observing. It was so quiet and soothing. I knew that this was an experience unlike anything else in the world. Swimming became my sport of choice, and I quickly became convinced that I wanted to be a marine archaeologist. I was so fascinated by the prospect of finding buried treasures or sunken ships while scuba diving. But instead of becoming a marine archaeologist, I became a cook. And while I tried to keep up the scuba diving when I’d visit my family in Florida, on my small salary and with barely any time off, it just wasn’t something I could afford to do very often. I had to stop scuba diving for a very long time, until I opened my own place, Willa Jean. As the restaurant got its legs and started to walk, I had the luxury of time again, and I had this wonderful staff that allowed me to take some vacation days. So, a little while ago, I went back to Florida to scuba dive. It was just like riding a bike. Having this turbulent and chaotic and busy life, scuba diving let me go back into that quiet. I fell in love with it all over again. I am planning scuba diving trips this year — I’m flipping a coin over Belize or the Bahamas. I’ve gotten a bunch of my friends into it. I want to get my staff into it. I’ve just realized that scuba diving is something I need to be doing. Whenever I’ll go on a work trip or sign up to do some festival, I’ll always see if I can add a day on and go out to the ocean. There are all of these conversations happening right now in the industry about mental health and the importance of self-awareness and self-care. That’s what scuba diving does for me. It’s just an extension of that conversation—being able to turn everything off and detach from your mind and do something that feeds you and inspires you in a different way than food is what creates balance for me. You can’t take your cell phone scuba diving. It’s about being silent and present in the moment. I honestly think everyone should be doing it. New Orleans restauranteur Ralph Brennan looks back, 12 years later. Being blind was never going to stop Chef Laura Martinez from running her own kitchen. Cesar Gutierrez left Rikers at 16 — now he's a valued member of Daniel Boulud's team. Nicole Ponseca's fight to give Filipino food its New York Moment — and find her true life path.